From the moment expecting parents receive the good news that a baby is on the way, they do everything to welcome baby to the world and to provide a happy and healthy start in life. Decisions are made about everything from the color of the paint in the nursery to the kind of diaper and car seat to use. The search is on for the best stroller and crib. It’s a momentous occasion for choices to be made, big and small. Now, there is a new way for parents to bond with baby before birth. Sound Beginnings is a safe, comfortable way for moms to play music and voice for baby in the womb. Whether its classical music, mom’s favorite play list, or recorded messages from dad, Sound Beginnings gives parents a new way to connect with baby. Sound Beginnings is the award-winning way to play music for baby in the womb. The innovative design has done away with the need for Velcro or adhesives and, better yet, there is no assembly or disassembly required. The soft fabric band has built in high-quality speakers that are perfectly positioned for baby, and Sound Beginnings is so comfortable that it can be worn all day, even on the go. All mom needs to do is plug in her iPod or MP3 device and press play. When mom is done, she can toss Sound Beginnings in the washing machine, speakers and all. Moms and experts have been raving about Sound Beginnings, honoring us with 9 awards, including the Great Dad Award. They’ve chosen Sound Beginnings as the best way to play music for baby in the womb because it is the most comfortable and easy to use product available. Moms everywhere have found Sound Beginnings to be a great value for their money. 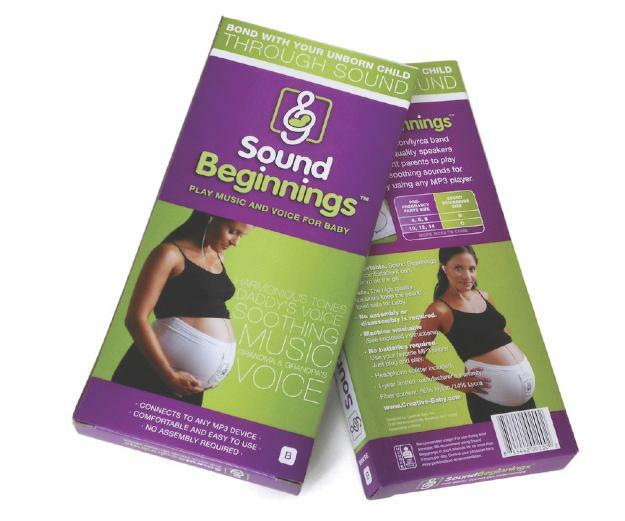 Sound Beginnings is a must for any expectant mom. It also makes a great baby shower gift. Win Sound Beginnings. Last date for entries is March 30, 2011.